I’ve written about “liberal disillusionment” in Turkey through the example of Taraf newspaper before. At that time, (as now), there was much talk about the ruling Justice and Development Party (AKP) government moving away from its reformist impulses and regressing into an increasingly authoritarian conservative nationalism. 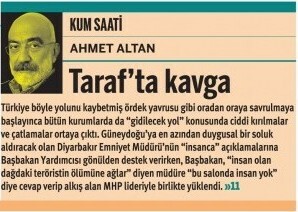 Taraf had previously been known as a supporter of the government’s anti-military crusade during its first two terms in office, but this support has evidently been waning in recent times, with increasingly strident criticism sent in the direction of the government by editor Ahmet Altan. There is a certain amount of onanism to all of this; but, of course, there is a fair amount of onanism to the whole institution of “köşe yazarlık” (column writing) that fills up every Turkish newspaper. Unfortunately, as Justin Vela pointed out recently on Eurasia.org, for many in Turkey: “Having an opinion that you express regularly in a media outlet is enough to make you a journalist.” As I have previously written in a piece on press freedom, although newspaper columnists do perform a certain important function, many in Turkey mistakenly believe that they alone make for an effective forth estate. The European Commission published the 15th(!) annual “progress report” on Turkey’s EU accession bid on Oct. 10. It makes for depressing reading – not only because it is 87 more pages of EU bureaucracy, but because it comes at such an inauspicious time, with Turkey’s EU accession process having slid into something worse than just abeyance. 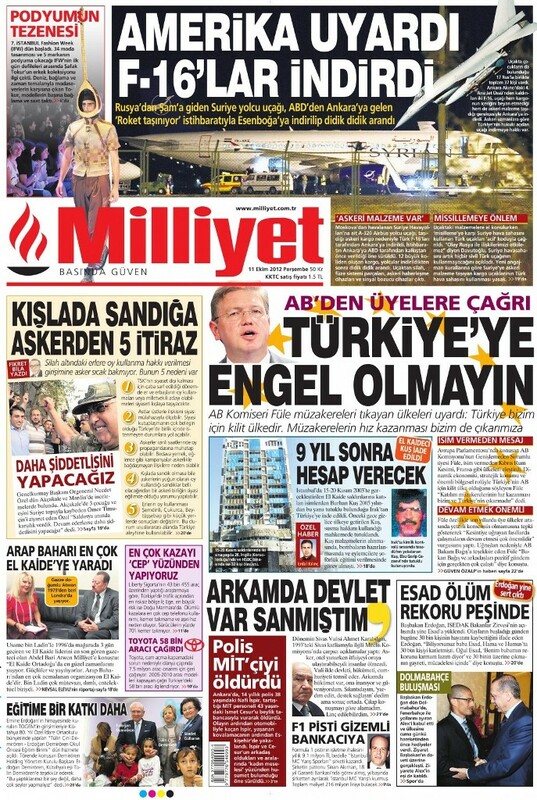 It has been widely interpreted as the harshest report on Turkey issued by the EU yet, criticising familiar enough failures: the lack of further steps towards a political solution to the Kurdish conflict, concerns about restrictions on freedom of expression and press self-censorship, judicial deficiencies, gender inequality, and worrying signs of rising discrimination against Alevis. 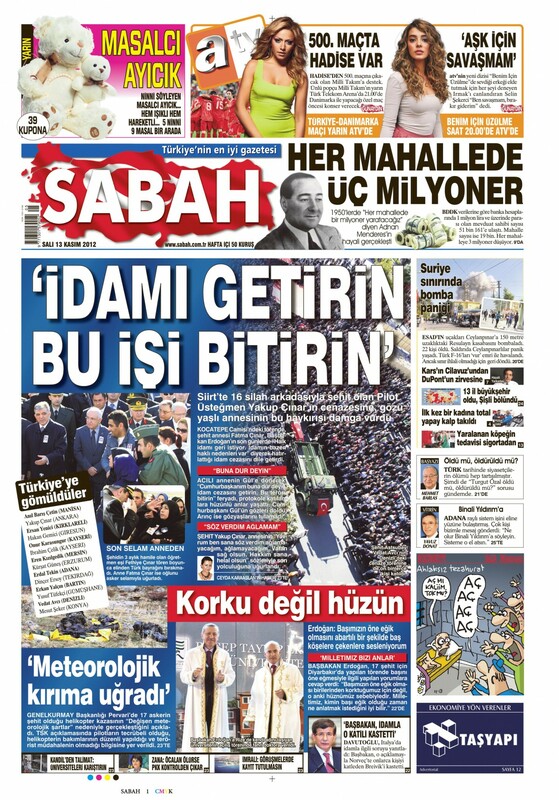 While it no doubt feels some resentment about Turkey being lectured to by the European Union, nationalist anti-AKP daily Sözcü seized the opportunity to once again slam the government, a banner on its front page declaring: “Sledgehammer from Europe to the AKP” (clearly referencing the controversial “Balyoz,” or Sledgehammer case). “The EU hasn’t swallowed Tayyip’s ‘advanced democracy’ tale,” it said. “I don’t think it’s very complicated. In Turkey, all disagreements return to two basic questions: Do we want European standards of democracy, or not? In Turkey, do we believe we are worthy of European standards of democracy, or not? In response to the report, Turkish Minister of EU Affairs Egemen Bağış described it as “disappointing,” and “unbalanced.” “The EU’s broken mirror is far away from reflecting the truth. The report is only a reflection of efforts to delay Turkey’s EU membership, since the EU is in an economic and political crisis,” he said.